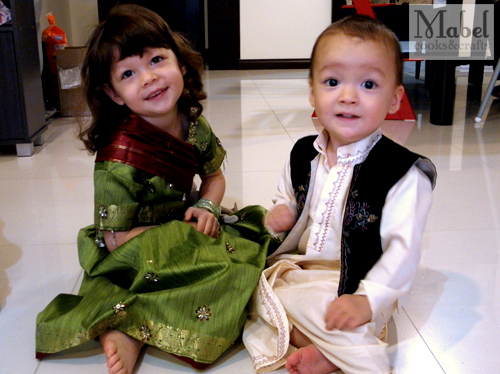 Home » Parenthood, Thoughts & Emo-ness	» Multiculturalism in Malaysia. The photo above is of me (in red) doing an Indian dance during a school concert. I was around 11-12 years old at the time. Next to me was my best friend – she’s Indian, btw – and my two Malay classmates. Our choreographer, trainer and instructor was none other than our Indian math/class teacher. I don’t really remember how I got roped into the whole thing except that my best friend told me that they were performing for the school concert and that I should try it out. At that time, I was hanging out at her place quite often and sampling Indian food, being exposed to Indian culture so I thought why not? Turned out to be one very interesting and memorable experience. I grew up in a multicultural environment. I studied in a multicultural environment both at primary, secondary and tertiery level – my good friend in college were Malay and Maldivian respectively. I worked with people from different backgrounds and ethnic groups – I had lunch with my Malay and Indian colleges. In fact, at one office, I ate more chapatis, dhaal and Malay mix rice than I did Chinese food! When I moved to France and Switzerland, I said goodbye to this and settled for a predominantly white-European environment. While there are a myriad of different cultures and communities in these two countries, they are not as prominent as in Malaysia or obvious – perhaps because I live in a small town and not in the cities where it is highly diverse and dynamic. In France, Eva was one of the handful of kids who had immigrant parents (me la) – there was a child whose parents were from Madagascar, another one from Algeria, one from China but that was it. Traditional costumes are not commonplace – in fact, at a school carnival, Eva was the only one dressed in one (a Nyonya outfit). A far cry from my experience where people wore Punjabi suits and baju kurung to work, baju Melayu during Hari Raya, cheongsam for Chinese New Year, saris and lenghas for Deepavali, etc. Credit must be given to my hubby for being utterly supportive and even persistent about me exposing the kids (and others back in Europe) to Malaysian culture and heritage. He would insist that I wear a kebaya to a friend’s wedding even though it would have been cheaper for me to just go out and get a regular dress. Even made Eva wear the same Nyonya outfit as well. So when we moved back to Malaysia, I jumped at the opportunity to expose my children to the very same things that I grew up with – the different foods, culture, festive occasions and so forth. Her kindy is filled with not just expats but locals as well (in fact, locals outnumber the expats) and her teachers are locals too. We arrived just before Hari Raya and got a chance to look at the various Raya decorations at shops. A few days ago, I got a note from the school stating that they would be having a Raya party and children were asked to come in a traditional outfit. I had missed the Raya sale and while I could settle for a normal baju kurung and baju Melayu for the kids, I went and got the kids a lengha/lehnga and punjabi/ali baba-styled outfits. As Eva paraded around in her lengha/lehnga, I am reminded of my own multicultural experiences. 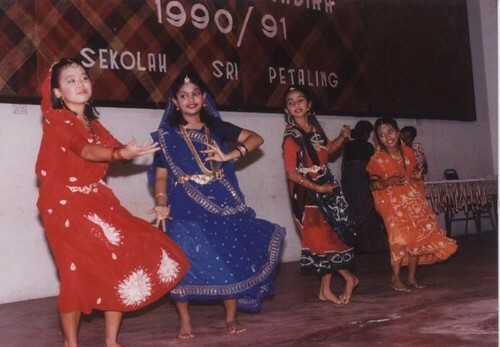 If there is anything amazingly awesome about being in Malaysia, it is this – a Chinese girl can dressed up in a sari and perform an Indian dance with both Indian and Malay dancers.